Let's Do It for ME! : Good Things Come in 3s - We're 3 Today! Good things come in threes! 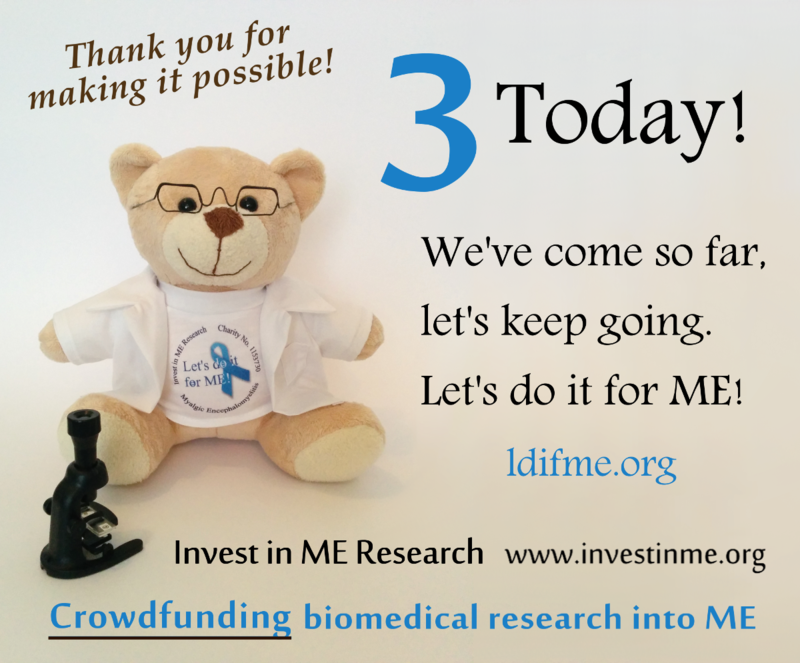 It's been three years since three house/bed-bound ME sufferers launched Let's do it for ME to highlight and support the work of Invest in ME, crowdfund vital research into the disease and help the charity progress its plans to establish the first centre of excellence for ME in the UK. Building of team work and a great community spirit, not least our planning group as people, inspired by the aims of the cause, got together to make it a success. New researchers bringing their expertise to the field of ME research, including Professor Simon Carding, leader of the Gut Health and Food Safety Programme at the Institute of Food Research, UEA, and Professor Jonathan Edwards, Emeritus Professor of Connective Tissue Medicine, UCL, who pioneered the use of B cell depletion therapy (rituximab) to treat rheumatoid arthritis. Funding of the foundation gut research project and a PhD studentship at UEA as well as the initiation of this work - recently featured in the Institute for Food Research Newsletter. Funding and initiation of preliminary B-cell study for a UK rituximab clinical trial at University College London. The three most successful IiME international biomedical research conferences and pre-conference research meetings yet, fuelling collaboration between researchers and educating health professionals. This year, as well as a CPD accredited conference DVD (not yet released), IiME have produced a Booklet to educate GPs and other healthcare professionals about the current state of research into ME that includes a summary of the research meeting and conference by Professor Jonathan Edwards. A second PhD studentship to learn about and research ME and gut microbiota. Invest in ME and Let's do it for ME are also working toward further research projects that will complement the existing ones, and our initial plan of a centre of excellence is still the main target of our work. Our ability to initiate research projects and progress plans for a centre of excellence is due in no small part to the many people who have taken the time and effort to get involved so thank you.. and Happy Birthday!